India Travel Tips - On the Road In India? These India travel tips are designed to give you an overview of the methods of transport you may encounter while travelling around India! Getting around India can involve curling up on the bunk of a sleeper train, bargaining with a rickshaw driver or perhaps navigating hair-pin bends on a Royal Enfield motorcycle, or for that matter, a scooter! Travelling India often means finding yourself in at least one unexpected vehicle, and it may well be that your times spent on the road (or railway track!) become your most memorable of the trip. Look out for our favourite highlighted India travel tips! Unmistakably bee-like in their colour, sound and activities the auto rickshaw, or tuk tuk, is to India what the black taxi is to London, or the yellow cab to New York. Painted yellow, the auto rickshaw is a three wheeled vehicle big enough for three passengers and a driver, but small enough to dodge in and out of the traffic. Drivers often adorn their vehicles with lucky trinkets, pictures, religious symbols or tinsel, and no two rickshaws are ever quite the same. 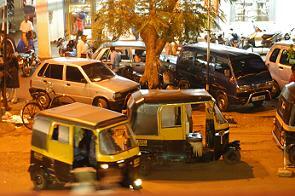 In large cities, tuk tuks are everywhere, but they are harder to find in rural areas or smaller towns. In tourist spots, rickshaw drivers will lend you their services for a day, for a price! A word on the price, always agree on it before the journey to avoid confusion at the end. Drivers will expect tourists and backpackers to be able to afford a higher fare than most Indian passengers, just consider what you might pay for a taxi at home. However if travelling in tourist areas the first price quoted is often too high and a little bargaining is normal. Talk to local people or long-term travellers to get a rough idea of what they pay. Outside tourist destinations, tuk tuks cost roughly R.10-20 per km. Once you have agreed on the price, sit back and enjoy the ride. Travelling by tuk tuk is one of the best ways of getting around India and seeing the country at street level. The first few journeys will definitely get your adrenaline flowing, especially in city centres. India travel tips: Tuk tuk drivers usually know some good accommodation options - useful if you arrive late and have not booked a room, though their commission will inevitably be paid by you! 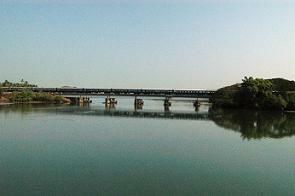 Getting around India on the train is one of the highlights of any trip, and also a cheap way to cover vast distances. Watching India's magical landscape unravel, ever-changing for miles, can make a deep and lasting impression. Overnight journeys are common, and settling into your bunk, chatting to fellow travellers and enjoying the often tasty food available all help to pass the time. Indian trains travel huge distances. If you are making a short journey, tickets can be bought at the station on the day of travel. Un-Reserved 2nd class tickets are the cheapest, but there is almost always a rush for boarding. You can often sit in the Non AC (2nd class) Sleeper, if no-one minds, and pay the little bit extra when the ticket inspector comes around. If you are making a longer trip, you will be assigned to the sleeper compartments (of which there are various classes) and will need to book ahead. Long train journeys can be booked at most large train stations, at travel agents where a fee of R.50 - R. 75 per ticket will be applied, or online at IRCTC Reservations. If you book in person at the station, a copy of the Trains at a Glance booklet (available at most stations) can be useful for finding train numbers. Sleeper Class is divided into AC (air conditioned - bedding is provided, tinted windows) and Non AC (far cheaper than AC - bring a blanket). Various classes operate in AC compartments. Sleeper Non AC consists of 8 berths per compartment. The top berths give you most privacy and you can stretch out during the day. The other berths form seats until night time. Bring plenty of water for your journey and a few snacks. Chain your rucksack under the chair with a good padlock. Keep passport and money in a thin pouch about your person. You can order hot dinner when the train staff come around to take orders - it arrives shortly after, is inexpensive and tasty. Set your alarm if you are to arrive early in the morning. Keep a hand sanitiser and toilet paper handy. Drink chai (sweet Indian tea) frequently on your journey! The roads in India are uneven, and no more is this felt than when you are juddering along on a rickety old coach or bus. Despite the bone-rattling bumps, travelling by coach or bus in India usually has some advantages i.e. the price, and is character-building if nothing else. Coaches go from city to city, transporting tourists and Indian travellers across great distances, sometimes overnight. They are reasonably priced, but not necessarily cheaper than the train. It is usually possible to get a lie-down bed above the seats, or you can recline in your seat. Food can be bought when the coach stops for breaks, and it is always a good idea to use the toilet when you stop. Consider taking snacks if you are on a long journey. Ear plugs and sleeping aids will help. Tickets can be bought from travel agents or hotels / guesthouses in many towns. Investigate a few prices before you buy, and do not expect your coach to closely resemble the luxury, air-conditioned havens of comfort you will be shown in the brochure. If you are taking an organised tour of India, you will probably find the condition of the vehicle is better. Public buses are very cheap and run locally as well as for longer journeys. If you are getting around India on a tight budget, buses are the cheapest way to travel. Tickets are bought on the bus, or just before travel at the bus station. Local buses can reach all those destinations that are not on the trainlines, and are a fraction of the cost of taxis and tuk tuks. For a very long bus journey, do not expect to be comfortable. Try to get a seat near the front - avoid one by the toilets. Take water, snacks, hand sanitiser and toilet paper. Getting around India is quick and easy if you decide to fly, and prices can be very cheap if you book ahead online, by phone or with a travel agent. Last minute bookings can often be made on the day of travel and will cost a little more. If you are on a short break, flying can save you valuable time and stress, and can open up the country in just a few hours. Click for more India travel tips about internal India air travel. India travel tips: Remove lighters, matches, sharp objects and liquids from hand baggage. They will be confiscated. Also ensure you are given a tag for your hand baggage for security to stamp. 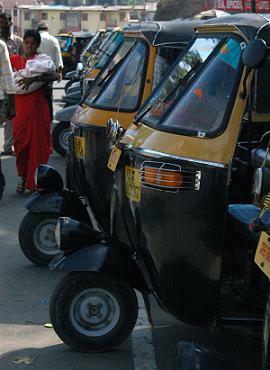 Taxis are an alternative to the auto rickshaw and they can be widely found throughout India. Though more expensive, they are useful when getting to and from the airport as they have enough room for baggage and can be booked from your guesthouse or hotel. When arriving at a major airport, taxis are often the first (or only) road vehicle you will see, and can usually be booked and pre-paid from booths inside the airport. You will normally be issued a number that corresponds to the number-plate of your car. Your pre-paid ticket is then handed to officials just outside the airport. Scenes outside an airport are often frantic when tourists arrive, with drivers vying for attention. If you have not pre-paid, ask a few drivers for their best prices to your destination. A common way for taxi drivers to make some extra cash is to take you to a hotel (often expensive) for which they receive commission. To avoid this, clearly give your hotel name and location or if you do not have one, give the name of an area you want to stay near. Agree on the price before hand unless you are on a meter, in which case you can ask for a rough price. If you are travelling in Goa you will find that taxis are more common than rickshaws, and more expensive than almost anywhere else. Expect to pay about R.150 for a 15 minute journey. Taxis can also be hired for the day. India travel tips: You can sometimes reduce your fare by asking around and sharing a taxi with other travellers. Some of the larger taxis carry up to six people. Navigating the roads under your own volition requires a confident driver. 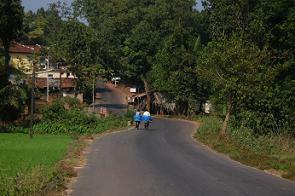 Indian roads are often bumpy, and the traffic is erratic. It is however a wonderful way to feel part of the country. Cars can be hired, but more common among tourists and backpackers is the scooter or bike. Scooters are cheap to hire (R.150 - 250 per day, depending on the time of year) and petrol is relatively cheap. You will need a copy of your passport and sometimes a deposit. Bikes can be hired at a higher price - expect to pay R.300 - 750 per day. Our section on the Royal Enfield motorcycle covers what you need to know if you decide to hire or buy a bike in India, and provides further India travel tips. India travel tips: When navigating, it can help to make a list of villages or towns you will travel through, and ask locals the way town by town. Cheap road maps can be found at tourist information centres. 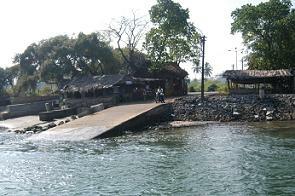 If you are travelling in Kerala you may well be spending some time on the water. The peaceful backwater Kerala region is what make this destination famous, and the luxurious houseboats are the way to travel in style. Boating is a popular pastime in India, and many lakes hire out pedal or row boats for a minimal fee. Many local boat owners and fishermen can offer backwater tours / dolphin spotting trips at a reasonable rate, which will also help support the local community. Bicycles are very cheap to hire in India, and are great for quieter towns. They can be hired by the day or for longer periods. Mountain biking is also growing in popularity in India. If you plan to travel by bicycle, you can bring a bike to India by plane (contact your airline), or have it shipped. Coaches and buses often will accommodate a push-bike but if you want to travel on the train (unless it folds!) you will need to put it in a separate compartment as with a motorbike. India travel tips: On the Indian road you are the smallest vehicle. The unwritten law of the Indian road states the larger the vehicle, the more right of way. Wear a helmet, use a loud bell! Trekking is very popular among tourists to / within India, and there are numerous option to explore some of India's beautiful countryside and landscapes on foot. For India travel tips on available treks and bookings, visit local tourist information centres. Some hotels and travel agents will arrange treks, but you may pay a commission. Though India is deservedly well known for its routes in the Himalayan foothills, there is plenty of stunning scenery in places off the main tourist routes, such as in the hill stations of the Western Ghats in Kerala and Tamil Nadu. Exploring where you stay on foot doesn't cost a rupee and is a wonderful way to enjoy India, its beautiful landscapes and friendly people. India travel tips: Eco-tourism is designed to benefit the local community and to protect its wildlife. Look out for eco-tourist programmes if arranging a trek. Thinking of hiring a motorbike and want more India travel tips? Have a look at our section on the Royal Enfield motorcycle for some options and advice! More India tourist information for travellers to India. Comprehensive guide to the beaches of Goa with plenty of photos and personal recommendations. Drift through the lakes and narrow, palm-fringed waterways of Kerala's beautiful backwater regions. The dramatic remains of Vijayanagar are set in one of south India's strangest and most stunning landscapes.